I loved this book. 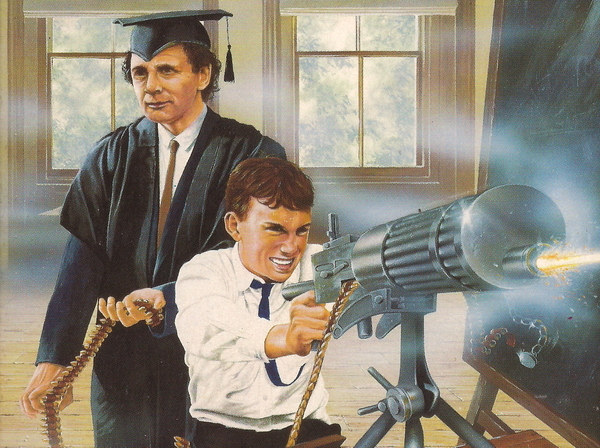 I hated this book. I was enthralled by this book. I was frustrated by this book. 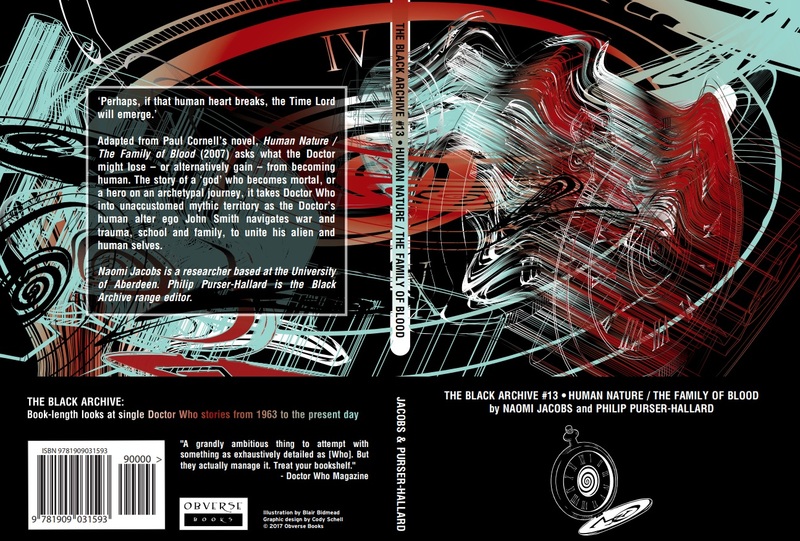 The Black Archive #13: Human Nature/ The Family of Blood, written by Naomi Jacobs and range editor, Philip Purser-Hallard, starts off well and finishes strongly, but there’s a huge stretch in the middle that wouldn’t feel out of place in the chase episodes of Planet of the Spiders. 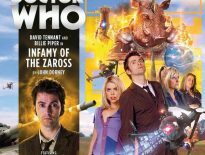 The book starts off by taking advantage of the fact that these 2007 TV episodes were based on a previous New Adventure novel by the same writer, Paul Cornell, and conducts a quite thorough comparison of the two. This is where the heart of the book lies. The differences and similarities are incredibly interesting to read and left me wanting to re-watch and re-read, and see what I could pick up myself. Aside from I, Who, it’s nearly impossible to pick up a decent tome regarding the New Adventures and this particular guide is every bit as much about the book as it is about the episodes. It’s wonderful to see The Black Archive naturally extending into this arena, albeit briefly. Some readers might have an issue with this; I most certainly didn’t. It’s worth noting that two things stopped me from loving this book. The first would be the footnotes that appear practically on every page and, on occasion, occupy more of the page than the actual text. This was an issue in the Scream of the Shalka installment as well and I’m beginning to suspect that it’s probably an editorial decision. Sadly, it’s one that doesn’t work for me at – it felt like I was reading two books simultaneously – but mileage will, no doubt, vary. The other thing was the authors’ decision to delve into the theme of war. And I mean delve. If history is your particular thing then this probably isn’t a problem for you. I’m afraid it left me cold. Which is a failing on my part rather than the writers, admittedly. But to judge a book like this on the sum of its parts is perhaps unfair. A lot of the reference books on my shelf have huge chunks of unread passages. 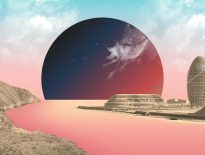 I love dipping in and out of them and reading the parts that interest me at the time, and, if I’d taken that approach here, then you’d be getting a glowing review rather than merely a good one. Jacobs and Purser-Hallard blatantly know their subject and aren’t afraid to let you know it. During the course of researching this book, they have even accessed some previously unmined areas of interest. And Superman II. Paul Cornell seems to refer to the film quite a bit in commentaries and interviews about Human Nature and once the similarities have been pointed out they’re quite hard to ignore. If you haven’t seen Superman II before reading this (and why the hell not? ), then I would if you want to avoid spoilers. This is a very, very, VERY well researched book. It shows especially in the chapters that discuss war and the author’s changing attitude towards it. So the episodes left you curious about the war, the New Adventures or Paul Cornell’s world view, then I can’t recommend this book enough. The Black Archive #13: Human Nature/ The Family of Blood is out now from Obverse Books, with prices starting from just £3.99.